It was the bar whose name everybody knew, even though it had no sign: Chumley’s, in Greenwich Village. A speakeasy during Prohibition and a destination for tourists seeking a snapshot or New Yorkers seeking a nightcap, Chumley’s has been closed since a wall collapsed in April 2007. 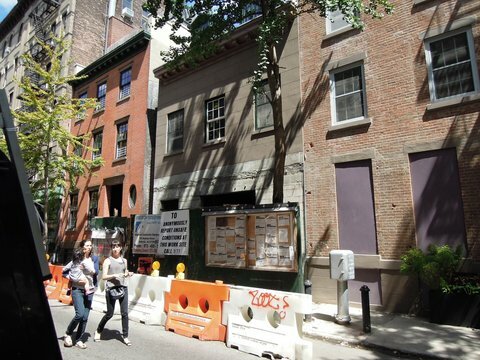 Chumley’s owners had said they hoped to reopen in a few weeks, then a few months. By 2008, they had removed the booths and tables — and the photographs that had lined the walls — and stored them for safekeeping. The building’s landlord, Margaret Streicker Porres, said in August 2008 that she hoped the work would be completed in midfall of that year. Three years later, the construction barricades are still up. So when, really, will Chumley’s reopen? He said that earlier in the year, he had hoped to finish the construction work at the bar, at 86 Bedford Street, by now and bring back the furnishings and the photographs for an October reopening. ”That timeline did not work out,” he said. But that now seems unlikely, he said, and he has set his sights on 2012. Ms. Streicker Porres agreed that the rebuilding had been unusually complicated — and that the end finally seemed to be in sight. ”We are working through the last of what we expect to be the construction issues,” she said. A second adjacent building, at 84 Bedford Street has been renovated as condominiums. Ms. Streicker Porres said the apartments were being marketed through Brown Harris Stevens. One, a two-bedroom duplex, is listed at $2.124 million. Another, a one bedroom unit, is priced at $1.015 million.